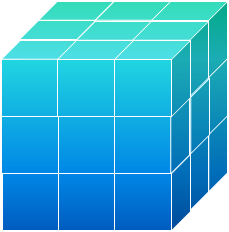 Suppose 27 identical cubes are glued together to form a cubical stack, as illustrated below. If one of the small cubes is omitted, four distinct shapes are possible. If two of the small cubes are omitted rather than just one, twenty-two distinct shapes are possible (see previously submitted Cubicle Stack at BrainDen.com). Now, if three of the cubelets are omitted, how many distinct shapes are possible? A couple more revisions because I can't tell the difference between counting to 4 and counting to 6 at night. Thanks for checking all these. That's a lot of numbers! ..., T23, T24, T25, T26, T27 (i.e. 13?, 22, 4, 1, 0 with T27 = 0, which is equivalent to the removal of all 27 cubelets leaving nothing. The maximum value would be for T13. T26 would leave 1 cube. But T25 leaving 2 cubelets leaves more than 4 shapes assuming the two cubelets don't have to be connected. . . I'm going to stop. My answer is 231. First, I tried mapping out all of the possible relationships between two cubelets (22, as established previously). I lettered them from A to V. I was going to permutate them against each other in such a way as to return a three letter unique output that forms a triangle. As long as the output generates a legitimate unique triangle, the pattern is accepted. So AAC is a triangle that connects the core to two edges, both of which are near each other. AAA and ABC, for example, are invalid outputs, since they don't form a triangle. ACA and CAA would also be invalid, since this is an implementation of AAC. Before beginning the problem, I had estimated that the answer would be around 90 and easily countable. I should have known better since the likes of Thalia, Mr Ed, and Bonanova were struggling with counting the previous iteration with 22 unique configurations. I figured if I could name unique connections, it wouldn't be so difficult. After a short period of that, I feel now that the answer is probably less than 250, though I have no solid proof. I'll wait for more solutions to come in before starting to comment. Watch out for shapes that can be obtained by rotation, thereby duplicating some of them! For MMM, you can have the middle out of opposite sides and a middle between them or you can have a middle out of the top of the cube and two out of sides that are next to each other. I will provide the numbers using CaptainEd's system later. Oh, jeez, you're right. I dunced that pretty good. Your first score was actually 7/16! Now you've changed 2 of the correct ones to incorrect and 2 other incorrect ones to correct. Thus, as your latest stab count stands, you again have 7/16. Sorry for my initial miss checking! Yes, you have indeed found one of them! Have another look at XCE and XEE. If you add the other two newly combinations found by you, you will have at least 10/16 correct. We can later deal with the more difficult ones! ... one of your "high" numbers for multiple combinations is correct. Found that after checking, rechecking, counting, and recounting. Thus, add one more to your score! Lol. I'm not sure what my score is anymore. Can you score this? Recount. EEM and EEC intentionally left out. About CEX : I'll get back to you on this one. Maybe the "four" in the two-cubicle removal is incorrect. Please have another look! The corners are 1, 3, 7, 9, 19, 21, 25, and 27. So starting with cubelet number 2 as the edge (numbered starting with the side facing us), you can remove corner 1. But if you number from the top face, that shape can be called 1,3. Each time you remove an corner, there is a second corner that will give you the same shape. 2,7 from the side is 2,21 from the top. 9 pairs with 19. 25 pairs with 27. So I'm counting 4. What am I missing? Sorry, I was wrong and you're not missing anything! The 2-cubelet removal definitely gives 4 CE combinations, so you're right with the center additionally removed (CEX) too! Your score now 12/14.